This canvas was written in 1873. All the summer of 1872, Kuinji spent on Valaam. The result was the emergence of this ingenious creation. The landscape is at a crossroads. On the one hand, this is a realistic understanding by the artist of nature. But at the same time, the characteristic influence of romanticism is still felt. The viewer feels the romantic features in the foreground, which is deliberately highlighted by the light of a thunderstorm. Kuindzhi was able to overcome in his work the over-exertion with which a special state of nature was transmitted, which was characteristic of the works of late romantics. The landscape is written with a special grace. Shades of light are incredibly subtle. You can feel the incredible integrity, which completely removes the contrasts of light. 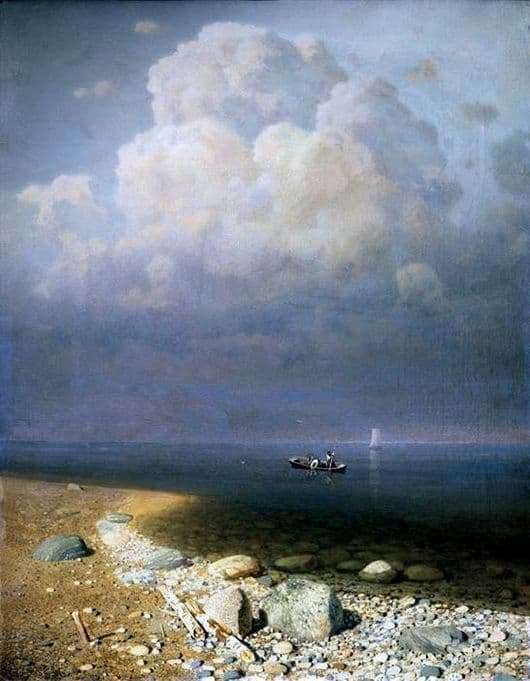 Kuindzhi transmits impressions of Lake Ladoga. How here is quiet and stately. The painter seeks to depict the rocky bottom of the lake, which miraculously shines through the crystal clear water. Painting “Lake Ladoga” was opened northern series of works of the famous painter. For the artist the most important is the water space and the sky. The space is very interesting. We feel how limitless it is. A single range of colors combines the lake and the sky. The color is incredibly rich and intense. The lake and the sky seem to be merged together. They completely transform into each other. The horizon, slightly perceptible, is the only border between them. But the boundaries of the most conditional, so you can fully feel the movement, the transition from one space to another. The momentary bizarre way moves into the future. Sandy gray clouds do not create a feeling of heaviness. They are balanced by a bank composed of detailed stones. The atmosphere of a thunderstorm is emphasized by the coldest gamut of blue and gray. Simply amazing is the special play of shadow and light before the start of a thunderstorm.